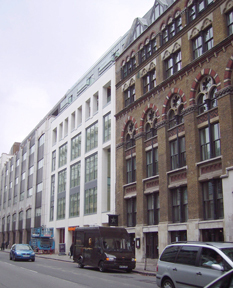 Lawrence:King were appointed in February 2005 to develop and implement the design and construction of 17-32 Farringdon Road, London EC1. Designed in association with Trehearne Architects, the development provides a 9 storey mixed use development, comprising a commercial unit, and Sainsbury?s Local supermarket to basement and ground floor levels. Three floors of open plan office accommodation and 14 private residential units, providing a mix of 1 bed apartments, 2 bed duplex and 2 bed penthouses are located on floors 4 to 9.